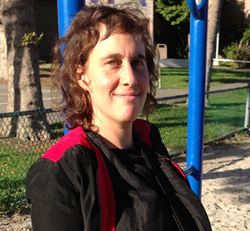 Margit Galanter is a movement investigator and dance poet living in Oakland, California. Her practice, Physical Intelligence, encompasses her unique research perspective, helping people experience the innate clarity and vitality one can uncover through the potency of movement. Margit is trained as a movement artist, Guild Certified Feldenkrais Practitioner and Chinese energetic practitioner, and her fascination regarding the construction and value of physicality has drawn her to collaborative embodied research for decades. She has lived in Indonesia several times since 1991, where she has taught, community organised, and practised traditional and contemporary movement arts. Margit is co-editor for Embodied Lives, along with Katya Bloom and Sandra Reeve.